Some of cinema's most notable heroes are also its most notorious criminals. Don and Michael Corleone; Tony "Scarface" Montana; Henry Hill; the Joker - these are reprehensible human beings for whom we have the utmost respect, at least for a time. Maybe it's their sense of power; their overwhelming confidence; their persistent nature; or their enigmatic souls. Whatever the reason, we find them fascinating and it's hopeless not to like and care for them, despite their day jobs. We're not necessarily drawn to these people because they're criminals, but because they're complicated individuals who overcome seemingly impossible circumstances in a world always working against them. The fact they're immoral, devious and sometimes grotesque is beside the point. The hero of A Prophet (French title Un prophète) starts off like many of the characters above - he enters a world he doesn't understand and can't control; he's ordered by those in power to carry out an unconscionable act; and he's eventually accepted and protected as long as he plays by the rules. This is a fairly common setup for a crime story, but it's what happens afterward that makes A Prophet such an intriguing story, when the hero learns who he is and finds a place of his own. His name is Malik El Djebena (Tahar Rahim), a fragile and illiterate 19-year-old of Arab and Corsican descent. As the film opens, Malik is starting his six-year sentence in a French prison and immediately becomes the victim of beatings, theft and homosexual offers. 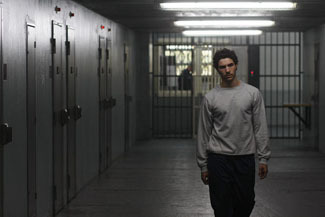 The prison is secretly controlled by the Corsican Mafia, led by one of the inmates, the white-bearded César Luciani (Niels Arestrup), who is currently serving more time than his entourage. After Malik proves himself loyal to the Corsican network, Luciani sends him on more important missions, both inside and outside the prison walls. All the while, Malik is tortured, or perhaps guided, by one of his own victims. Through dreams and visions, he gains an inexplicable ability to sense things before they happen, hence the film's title.